Well this wasn't an easy choice. I like making things. It makes me happy. I decided to go with the most recent thing that I have made. Seeing as I love nail polish, frankening was the next inevitable step. 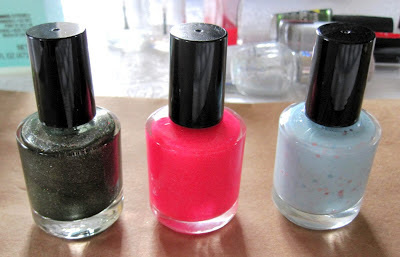 Frankening is pretty much taking pre-made polish and mixing them to create new "custom" colors. These are three of those creations. I'm hoping to start creating more polish, from scratch, in the next few weeks. It's something I have been wanting to do for awhile. So hopefully things will go well and you'll be seeing some of my creations soon!